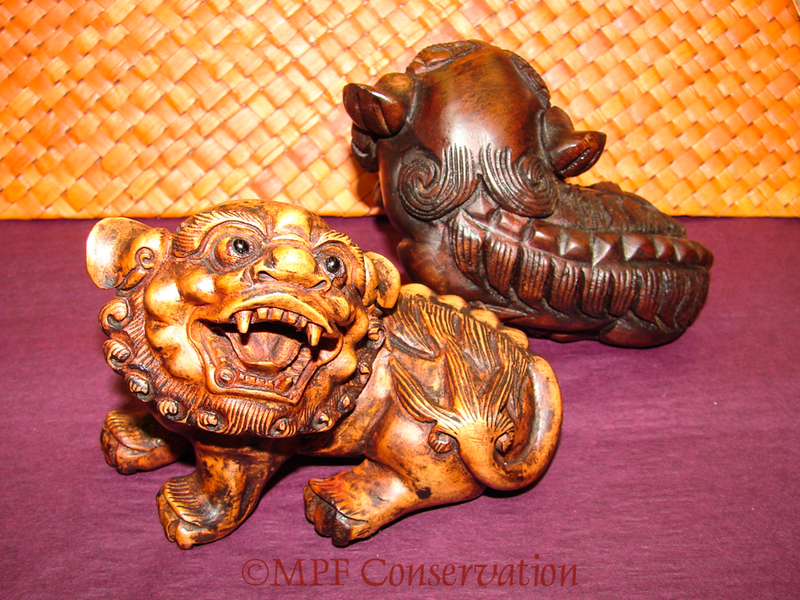 Our client brought his small carved wooden guardian dogs to us for treatment. the female often has her paw on a cub representing nurture. They are yang to yin. The term “Fu” may be a transliteration to 佛, pinyin: fó or 福, pinyin: fú, which means Buddha or prosperity. In Asia they are seldom referred to as “dogs”, but are considered Lion statues, as lions are protectors of Dharma, or the sacred teachings. Having owned Chow-chows, and wondering about lions in China, I always assumed they depicted Chows dogs, who are fierce protectors of their families and were used as warrior dogs. The small statues were quit dirty, having never been cleaned to his knowledge. Kate began cleaning all the tiny crevices with cotton swabs. Dust, followed by embedded grime probably from normal household environments, was loosened and removed. We then coated the wooden statues with a blend of warmed waxes and resins. Between each coat they were allowed to thoroughly dry under warm lights. Each statues lovely carvings and personality brightened. The original finish was enhanced and protected, not refinished. 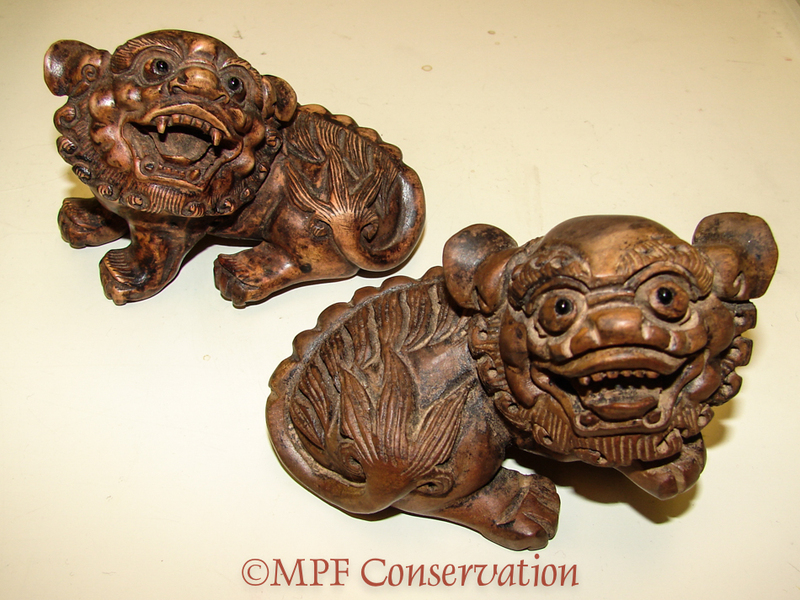 This entry was posted in antiques, art, conservation techniques, decorative motifs, preservation, process, reparation, restoration techniques, shellac, traditional varnishes, waxes, wooden objects and tagged #artconservation, #chineselionstatues, #chinesestatues, #foodogs, #fudogs, #paintconservation, #statuerepair, carved, Chinese Lion Statues, Chinese statues, conservation, Fo Dogs, Foo Dogs, Fu dogs, Gamblin, gilded objects, painted finishes, painted objects, preservation, statue conservation, statue repair. Bookmark the permalink. Wow – that’s a dramatic difference. Nice job. I know, amazing difference in a non-invasive treatment.